This is Corrie’s favorite Lebanese dish. Since he loves Lebanese women err…I mean food, that’s saying a lot. I honestly typically don’t care for eggplant, and I happily eat this. My mom pretty much either always makes this when we’re home or has a dish of this in the freezer to send back with us for him. See, I’m not the only one who thinks it’s fun to spoil him rotten! In a small saute pan, fry pine nuts in 1 Tbsp. of butter. In a non-stick skillet, melt butter over medium heat. Saute onions over medium-high heat. Add meat and saute until brown. Add pine nuts, salt, pepper, and cinnamon and mix well. Set mixture aside. Preheat oven to 350 degrees and pull out a 13 x 9 baking dish. Remove stem and hulls from eggplant. Partially peel eggplant (from top to bottom) so that you have alternating purple and white strips. Cut eggplant horizontally into 1/2″ discs. Heat butter and olive oil in a skillet. Meanwhile, line a plate with paper towels. When hot, saute eggplant on each side until they are golden brown. Place the eggplant on the paper towel-lined plate to absorb any excess grease. When finished sauteing all the eggplant, place each slice of eggplant side by side in the 13 x 9 dish. Top each eggplant slice with approximately 2-3 Tbsp. of the meat and onion stuffing mixture. On top of the meat, on each slice, place 1 whole canned tomato. Pour the remaining tomato juice over the eggplant evenly, and then cover with the tomato sauce. Sprinkle generously with salt and pepper and add allspice to taste. 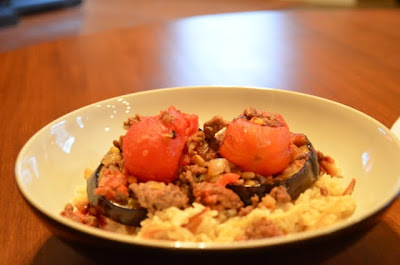 Bake for 20 minutes and serve on top of Lebanese rice. Let’s just say some people are worth spoiling!! !